Mendeleevite-(Ce): Mineral information, data and localities. 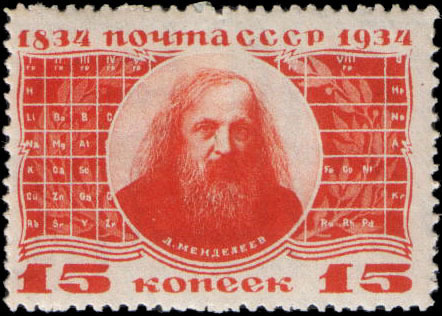 Named to honor of Dmitrii Ivanovich Mendeleev (1834-1907) - the great Russian chemist, the discoverer of the periodic system. The Ce analogue of mendeleevite-(Nd). Not to be confused with mendeleevite - a synonym for a local variety of betafite from Slyudyanka region. Doklady Akademii Nauk 452, 441-444(2013); Agakhanov, A.A., Pautov, L.A., Sokolova, E., Hawthorne, F.C., Karpenko, V.Yu., Siidra, O.I., Muftakhov, V.A. (2016): Odigitriaite, CsNa5Ca5[Si14B2O38]F2, a new cesium borosilicate mineral from the Darai-Pioz alkaline massif, Tajikistan: Description and crystal structure. Mineralogical Magazine, 80, (in press).